It’s not wastewater. It’s resource water. The Marquette-lez-Lille station is a technological reference and a model of sustainable development. Launched in Feb 2013, Ovilléo, the new wastewater treatment plant in Marquette-lez-Lille, has a capacity of 620,000 PE (population equivalent). It treats wastewater discharges by ensuring compliance with the new European standards, which include nitrogen and phosphorus in addition to carbon components. It also deals with stormwater, which was not the case before. In parallel, Ovilléo uses an innovative thermal hydrolysis method to reduce the amount of sludge produced and increase the production of biogas. Results: a low carbon footprint and almost total provision of the thermal energy needs of the plant. Furthermore, after drying, the sludge becomes a valuable resource for re-use in agriculture and cement manufacture. Process were applied for noise and odour reduction. This effort to achieve "zero harm" is also embedded into the construction of the plant. The design of the new plant has made the whole site more compact freeing up seven acres of land which have been transformed into an educational garden. The buildings blend into the environment as they are covered with vegetation and no tank is exposed to the open air. As customers search for the best ways to treat wastewater for reuse or safe return to the environment, they can use Xylem’s new portable pilot containers to evaluate different options and optimize their treatment solution. The state of Florida has more than 1,300 miles of coastline, and now it has new legislation to protect the ocean waters that make this coastline such a popular tourism destination. With the passage of a statewide Wastewater Disposal Bill, all facilities that discharge wastewater through ocean outfalls (pipes that discharge directly into the ocean) are required to meet higher treatment requirements by December 2018 and achieve at least 60 percent reuse of the wastewater by 2025. Whether the wastewater is heading out into the ocean or being “reclaimed” for beneficial purposes, it must be free of more pathogens and trace contaminants than ever before. With these deadlines fast approaching, wastewater treatment plants in Florida are looking for the best treatment processes that will enable them to most efficiently meet or exceed the new wastewater quality mandates. 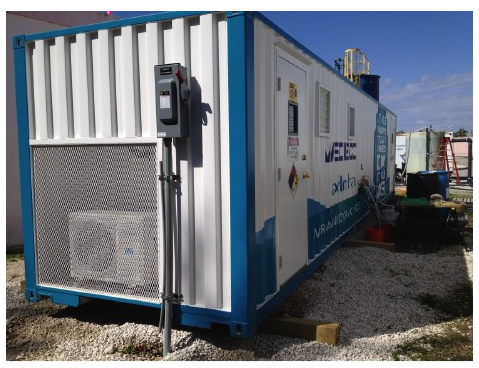 In Hollywood, Florida, a wastewater treatment plant installed a pilot plant to evaluate an advanced treatment “train” – or series of treatment processes – that includes the first MiPRO pilot container from Xylem. From the outside, these Xylem MiPRO Advanced Oxidation Process (AOP) pilot systems look just like shipping containers. But inside they offer advanced treatment systems that use ozone, ultraviolet light and hydrogen peroxide – or any combination of the three to create an AOP – to let customers evaluate and optimize different methods for treating their wastewater. The Xylem “plug-and-play” containers are simply placed on a customer’s property and connected to power and water supplies. Once onsite, the Xylem treatment system is customized by the operator based upon local contaminants, the water chemistry and the water regulations. Customers can evaluate six different treatment configurations, sometimes simultaneously, to find the best option for designing a full-scale treatment solution. The Xylem containers are not intended to be permanent solutions. They are portable, temporary “pilot systems” that guide customers in making informed decisions about the best wastewater treatment option before they make huge investments in full-scale systems. AOPs are a relatively new type of treatment solution and one of the most effective technologies for treating contaminants that can’t be removed by conventional systems. With water reuse now one of the fastest growing sectors of the U.S. water market, AOP systems are on the radar of more and more cities, towns and companies. In Whittier, California, a Xylem MiPRO AOP container is now part of a high-profile project, sponsored by the WateReuse Research Foundation, to demonstrate the effectiveness of multiple barrier treatment technologies – including ultraviolet, ozone and AOP – as part of a “direct potable reuse” solution. 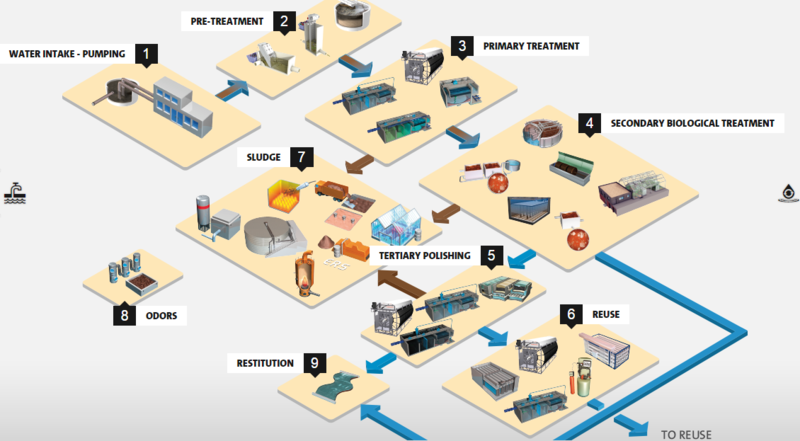 Direct potable reuse means treated and reclaimed wastewater is sent directly back into a city or town’s water treatment plant or water distribution system. Inland Empire Paper Company (IEP), located in Millwood, WA specializes in the production of newsprint paper using a combination of mechanical pulp and recycled newspaper pulp. IEP produces an average of 525 tons per day of newsprint and specialty paper products in 20 to 40 pound weight paper. Waste wood chips collected from local sawmills are processed to produce up to 475 tons of thermo-mechanical pulp (TMP) per day. IEP also recycles newspapers collected from around the country for the production of up to 350 tons of recycled newspaper fiber per day. The recycled newspapers undergo a deinking process and are blended with the TMP prior to the bleaching process. IEP then dilutes the bleached pulp with water to lower its consistency to approximately 1% solids for introduction to the paper machine. Water is removed via a press and dryer process to produce paper with approximately 8% final moisture content. IEP generates wastewater flows averaging 3 MGD (473 m3 /hour), loaded with high strength BOD5. The wastewater is deficient in nitrogen and phosphorus, so ammonia and phosphorous are added to the system as essential nutrients for the activated sludge system. IEP also has a series of production campaigns for High Bright Paper runs that lead to higher organic loading and sludge bulking. The High Bright Paper campaigns run for a period of two days during which the wastewater treatment plant can see influent MLSS levels over 5,000 mg/L. The challenge for IEP was to meet the stringent effluent discharge limitations set forth by the Washington State Department of Ecology for direct discharge to the Spokane River. 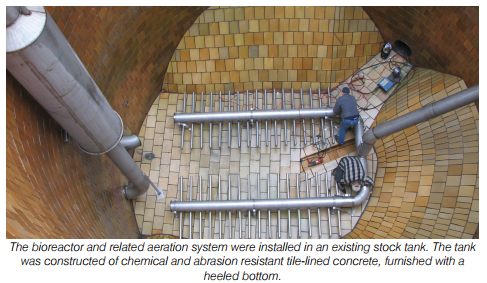 This was achieved in part by retrofitting an existing Stock Tank into a Headworks BIO™ Inc. ActiveCell® Moving Bed Biofilm Reactor (MBBR) capable of reducing the BOD5 load by 44% prior to an existing Orbal oxidation ditch treatment system. The goals of the project were to off-load the oxidation ditch, minimize or eliminate the growth of filamentous bacteria and provide IEP the capability for future growth in newsprint paper production. IEP also was planning for modular expansion in treatment capacity to meet more stringent effluent discharge limits and mill production increases in the future. Inland Empire Paper treated wastewater from its paper making process with an existing wastewater treatment system consisting of three major components: 462,000 gallon primary clarifier, 3-channel 2.1 million gallon Orbal ditch aeration basin, and a 705,000 gallon secondary clarifier. The current wastewater treatment plant required relief from intermittent hydraulic and BOD5 surges. During the summer months, the Orbal ditch experienced filamentous bacteria growth that negatively impacted settling rates in the secondary clarifier. IEP conducted a four month pilot study using Headworks BIO ActiveCell450 media that demonstrated the overall performance of the system along with the BOD5 loading and removal rates. The biological wastewater treatment system was designed using a combination of actual data from the pilot study and the MediaPro™ computer modeling program. The ActiveCell bioreactor was sized and designed to remove BOD5 at a nominal rate of 7.15 kg BOD5 per cubic meter of media per day, approximately a 44% reduction of influent BOD5 load. The bioreactor was sized to fit within an existing 25 foot diameter by 38.5 foot high stock tank. The tank provides approximately 120,000 gallons of working capacity by operating at a nominal side wall depth (SWD) of 34.5 feet (approximately 4 feet of freeboard). The existing stock tank was constructed of chemical and abrasion resistant tilelined concrete furnished with a heeled bottom. This tank happened to be one of the oldest tanks at the mill site, having been constructed in 1911. Solution Clarified wastewater from the IEP preclarifier is proportionally diverted to the ActiveCell bioreactor at a nominal flow rate of 1.58 to 2.05 MGD by means of a transfer pump and a set of control valves. Nutrients (ammonia and phosphorus) are then proportionally injected into the wastewater stream to support the biological activity of the treatment process. The wastewater is prescreened by a self-cleaning screening device with a ¼” perforated screen and flows under pressure to the bioreactor, entering the bottom of the tank 180° from the suction point. The 117,000-gallon ActiveCell bioreactor is loaded with a 67% fill fraction of ActiveCell450 media providing 402 m2 /m3 of active surface area. The neutrally buoyant ActiveCell450 media fluidized within the bioreactor provide a stable base for the growth of a diverse community of micro-organisms. The biofilm is self-regulated by a continuous sloughing process due to the thousands of collisions per second. Excess solids exit the ActiveCell bioreactors via a wedge wire retaining screen as TSS with the treated effluent. This continuous sloughing action exposes the biofilm to the organic load in the wastewater and provides a self-regulated high-rate biological treatment process that is responsive to load fluctuations. The ActiveCell bioreactor is provided with process air from an IEP supplied positive displacement blower. The air is diffused within the bioreactor by a 304SS coarse bubble aeration diffuser grid, also supplied by Headworks BIO Inc. The treated wastewater is pumped from the bioreactor via an internal retention screen riser mounted vertically to minimize air entrainment and to allow maximum wastewater retention within the bioreactor. The treated effluent is directed to the aeration ditch via a transfer pump controlled with a continuous level sensing device to maintain the target liquid level in the tank. Operation over a wide range of process changes and endure upset conditions.